Guests at the Southern Sun The Cullinan Hotel will find accommodation in one of the 394 comfortable and luxurious rooms that feature state-of-the-art room amenities. The Southern Sun Cullinan offers true luxury Cape Town Foreshore accommodation. Guests will feel at home in any of the spacious rooms, perfectly situated to give guests expansive views of Cape Town and the iconic Table Mountain. Cape Town Foreshore Accommodation is available in 394 rooms. 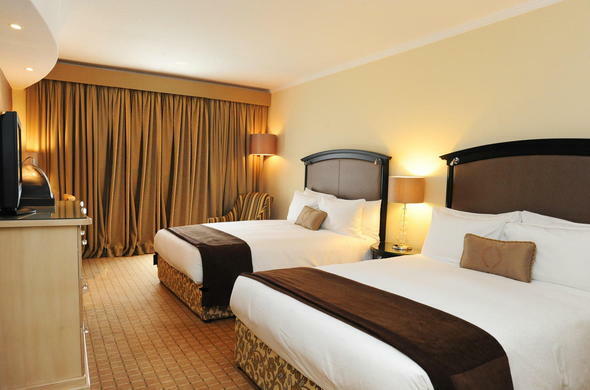 The rooms at The Cullinan comprises of 206 Standard Rooms, 164 Standard Surcharge Rooms, 18 Suites and 4 Executive Rooms. This hotel caters to the needs of its guests, therefore, non-smoking and wheelchair accessible rooms are available on request. Southern Sun The Cullinan has modern in-room amenities including individually controlled air-conditioning, remote control colour television with satellite channels and selected radio stations, direct-dial telephone with data-port, wireless Internet access, digital safe, tea and coffee making facilities, hairdryer, luxury bathrooms with bath and separate shower, separate wardrobe and a work desk with lamp.